BRISBANE Hotels have formed a significant part of the Australian Pub Fund’s growing portfolio and co-owner Mark Carnegie is confident they will deliver for the business. If the size of the crowd on hand to celebrate the redeveloped Elephant Hotel on a Wednesday night in late February is any measure, APF has made a good investment. The sprawling Fortitude Valley venue, which the fund purchased for $27 million in June, has been redeveloped, with the former backpacker hostel upstairs turned into a new open-plan bar whilst maintaining the venue’s traditional English style. The beer garden expanded at the rear of the property has also been expanded with an outdoor kitchen featuring a woodfire pizza oven and charcoal rotisserie. The former Elephant and Wheelbarrow is one of two hotels the business owns in the city, the other being The Exchange, purchased for $35 million. 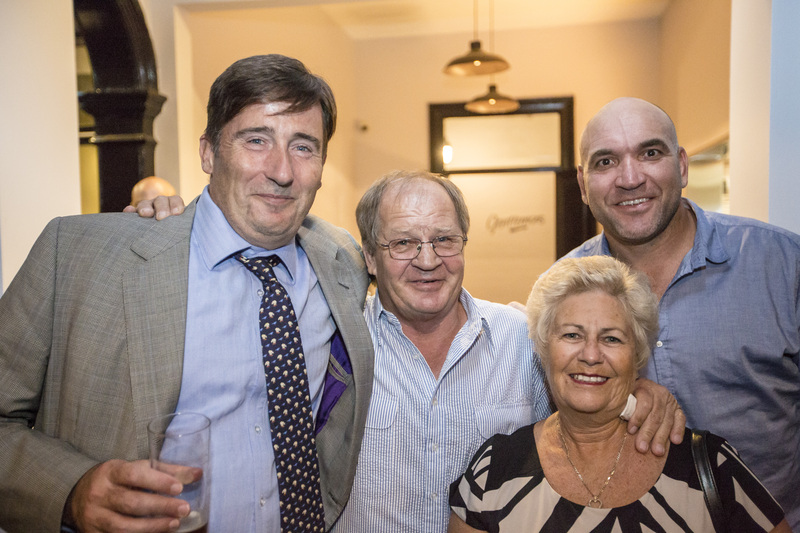 APF part-owner Mark Carnegie (pictured left, with Tommy Raudonokis, Trish Raudonikis and Gorden Tallis) says the sheer size of the Brisbane hotels makes them a desirable asset and the shareholders are “very happy” with their investments in the city. “In the context they are roughly the equivalent of six hotels, from a financial point of view, compared to Sydney because pubs in Brisbane are so much bigger, so it is a lot of money for us in terms of our commitment up here,” says the investment banker. The group operates under the management entity Riverside Group, founded by Paddy Coughlan and business partner Rodney Kelly. Seeing the potential in developing distressed pub assets, John Singleton, Geoff Dixon and Carnegie came on board and armed with a $65 million SunSuper investment, started buying up hotels around the country. The group owns 11 properties worth about $200 million and is in the process of deciding its next move. “The reason we bought into pubs is because a whole lot of people borrowed way too much money to pay for them and were forced to sell after the GFC and we thought there was a great opportunity to come in,” says Carnegie. “We had a series of successful investments in pubs in Sydney and then this one came up and we thought it was a really good pub and our guys would be able to help it, and we also believed Fortitude Valley was going to improve. The initial plan was to list the business on the Australian Securities Exchange in an initial public offering worth about $500 million, but that has been put on the backburner in the wake of the New South Wales Government’s new lockout rules implemented to reduce alcohol-fuelled violence. Carnegie says the group is open to offers from investors, but is thinking carefully about the right move to take. “We are waiting to see. Unfortunately the premier of New South Wales has made it rather hard to play pubs at the moment, but people still want to drink in them, so we will wait for the climate to change,” he says. Carnegie does acknowledge pubs have a part to play in curbing alcohol abuse and associated violence. “We feel overall people have got to do something about problem drinking, there is no doubt about that and sensible measures need to be applied and we understand we are going to have to shoulder our share of the responsibility for that so we don’t walk away from any of that,” he says.